Buying a short term rental home requires more than just considering the numbers, however. Anyone considering an investment home purchase needs to consider the intangibles as well. For example, location can be a huge determinant in the success of an investment home as a vacation rental property. T here are numerous times I have faced clients who have come to me ready to put their newly purchased home into the rental pool, and I have to tell them that their home is not really a good candidate for a short term vacation rental in our area. Vacationers have very specific needs they are trying to fill when they rent a vacation home. "Only certain types of homes work well as vacation rentals in our market," explains Rachael Lee, rental manager for Greybeard Realty. "Around here, they must feel like the mountains. The best ones have long distance views." Other prime locations that draw vacationers include secluded properties, homes close to streams and lakes, and houses in close proximity to town. We have also found that our renters' expectations are high and they are expecting luxury and more upscale amenities. The best rental homes have cable, provide high speed internet, offer a hot tub and allow pets. We often joke that the best vacation rental house would be a pet-friendly, wi-fi log cabin with a stream and waterfall that is close to the town center, in a private setting, with a hot tub, on a flat lot and of course an incredible view. Properties can be rented for short term or long term purposes, with varying factors within each type of rental market. Lee notes that in terms of rental returns on property in our area, the rule of thumb is that a weekly rental rate is about 80% of the monthly rate of a long term rental. For Greybeard Realty, a good short term rental rents approximately 15 weeks a year with the best rental unit in the company going for 31 weeks in 2006. "There are more expenses associated with short term vacation rentals," Lee notes. "There are cleaning costs, commissions if the property is managed, and utilities expenses which are different from long term rentals when the tenant pays the utilities." As with making all investments, home buyers need to do their homework on the benefits for their own portfolios and know their market where they are investing. In addition, they need to make sure there are no restrictive ordinances and zoning limitations on using the properties as short term rentals if that is their preference. Also, they need to be prepared to be patient with their investment and realize that vacation rentals do not usually create a positive cash-flow but are more a long-term capital appreciation investment. If a vacation rental property is carefully chosen in a beautiful location with the expected amenities such as the internet and perhaps some extras such as a hot tub, then property owners will have more success when renting their properties out and eliminate many of the disappointments. 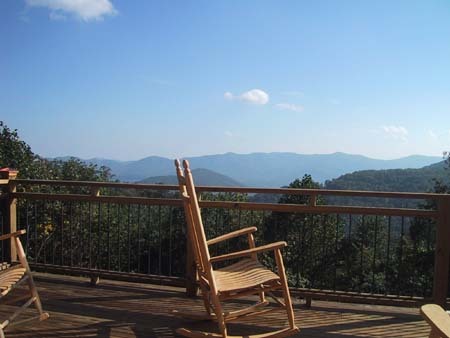 Paula Heimowitz convinced her husband to purchase a short term rental home in BlackMountain rather than putting more money into the stock market. For her, the pluses of making their first investment home purchase for use as a vacation rental have outweighed the minuses. "The hardest part of renting is worrying about what might go wrong or get broken", she says. "The biggest surprise has been how well it has been received and mostly how much we enjoy visiting the area and staying in our own house. The bears visiting our yard have been a big surprise for us as well." Renters and short term rental properties play a vital role in our community. In addition to the obvious revenue generated by these rental properties through property taxes, use tax and the like, renters themselves contribute to our regional economy through their travels and their purchases. Also, the support system for these rental properties, the cleaning services for example, benefit from the rental market. It is important not to underestimate the importance of these rental properties to our area economy. Bill Munn, Owner of Black Mountain Bakery states, "I would estimate that 30-40% of our business is from tourists so obviously vacation rentals play an important role in our local economy." Quality rental properties owned by knowledgeable investors are an asset to the area that generate income for a wide variety of area businesses and enhance the economic picture for our area.